The Defenders is a collection of photographic portraits that I shot as a commission for The Guardian weekend magazine. In partnership with Global Witness they have been publishing stories as a collaborative effort to document the deaths of environmental activists around the world. 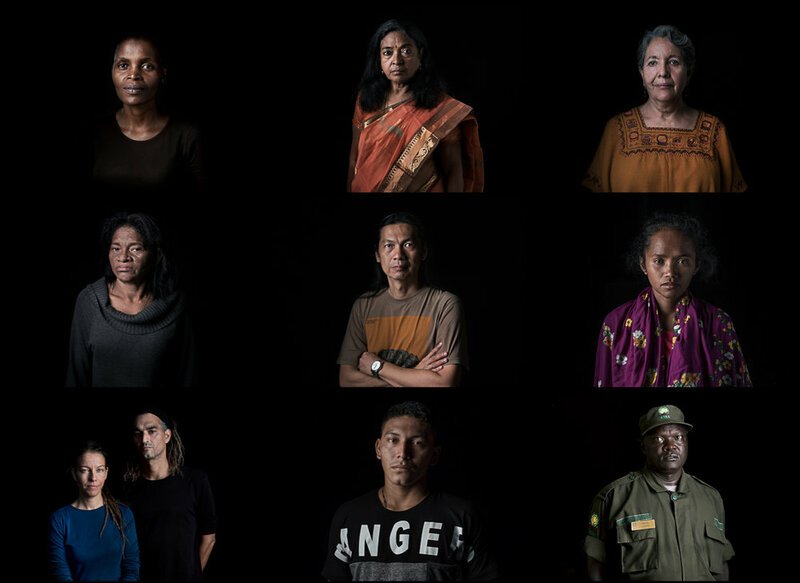 Together with Jonathan Watts, the global environmental editor, we produced a series of stories that documented the lives of 10 extraordinary activists. I approached The Guardian in November 2017 with the idea of creating a portrait series of defenders to accompany the work that they had been regularly publishing. They liked the concept and decided that it would be a good way to commemorate the partnership with Global Witness as it reached its one year anniversary. We found funding for the expenses through the generosity of Global Witness and the United Nations Environment Program (UNEP) and, what began as an idea from an informal conversation with my wife in the living room, quickly gathered pace to become one of the greatest adventures of my life. I feel incredibly humbled and privileged to have met with these 10 brave, inspiring activists, fighting every day to improve the world. I am grateful to them for graciously letting me into their lives and giving me the time that I needed to create the portraits. In the coming weeks I will release individual posts on the experiences of photographing each defender as well as their stories in full. For now I want to give an overview of the project and some of the considerations behind it. The journey to make this project took me on 47 flights, to 9 countries in 5 continents over a period of 3 months. In each country the distances travelled were vast, driving an average of 6 hours per day. The final project featured images from Brazil, Colombia, Mexico, South Africa, Uganda, The Philippines, India and Turkey. Before I had even made a single photograph I had taken 6 flights over 3 days and then driven for 4 hours to get to the small tourist town of Creel. This initial journey which took me from Cape Town to Johannesburg, São Paulo, Bogota, Acapulco, Mexico City, Chihuahua and finally Creel, is indicative of the next 3 months - 10 hour taxi journeys through the Colombian countryside, impassable mountain roads, young men with AK47's and the constant jet lag; all seemed like a normal days work by the time I landed in London at the end of my journey. From the beginning I worked closely with Jonathan Watts, the environment editor from The Guardian. We spoke with Ben Leather and Billy Kyte from Global Witness and made some preliminary lists of the people that we wanted to photograph. As the concept evolved it became important to cover as much of the world as possible. If we had the budget we could have easily doubled the size of the project but, working within our financial limitations, we stuck to the key places that needed to be featured. It was important for us to showcase as diverse a range of environmental issues as possible. The final project covers indigenous land rights, air pollution, water pollution, agribusiness (palm oil and coffee plantations), illegal logging, illegal fishing and poaching. The concept was to show the defenders as strong, brave activists, dealing with overwhelming adversity on a daily basis; whilst also capturing them in the landscape within which they operate. As Global Witness were producing their annual report, which was to focus on agribusiness, they asked me to also create a set of images that documented the work of four of the defenders in more depth than the formal portraits intended for The Guardian. For this part of the project I was privileged to be joined in Colombia, Brazil and the Philippines by the film maker Leo Plunkett. There is a delicate balance to strike when a film maker and photographer are working together on the same subject, at the same time. Both parties have to stay constantly aware of the other person and make sure that they are not stepping into the frame, or compromising the shot in some way. Leo and I worked well together, assisting each other and keeping each other motivated when the going got a bit tough. It was really inspiring to watch Leo work and the short film that he managed to craft, from some really challenging filming situations, is exceptional. Check out more of his work on Relevant Films. The excellent short film made by Leo Plunkett for Global Witness. Leo and I were joined by Guardian journalist Jonathan Watts for the first Philippines trip. Working in Mindanao was always going to be quite tricky and none of us were really sure what to expect; the island was unstable and still under martial law. Together we formed an efficient unit that allowed each one of us the time and space to work as we needed to. Watching Jon illustrated to me how an experienced interviewer operates; gently opening doors for his interviewee to express themselves completely over time. Read through any of the stories from the Defenders and you will have not doubt that Jon has an exceptional skill for connection with his subjects and communication with his audience. When conceptualising the project it was clear that the key photographs would be the environmental portraits. The Defenders are linked to their land through their activism, and so to include the environment in the images was essential. It was important however to ensure that we were not putting any of the subjects at risk. Many of the countries that we were working in are politically volatile and the reason for the defender being included in the project was because they were in danger; these two factors meant that many of the subjects came with heavy restrictions of where the could and couldn't go. As an environmental portrait photographer this puts me in a tough position, sometimes being unable to photograph the subject in the place that tells the best story. I also wanted to photograph each person outside the context of their land, to abstract them from the world and show them as an individual; so in each location I constructed a studio with a black backdrop and a simple lighting setup that could be duplicated consistently around the world (as shown above). An portrait of the defender in the environment that they were risking their life to fight for. A portrait of the defender on a black backdrop. A landscape image to show how the environment has been affected. Fuji kindly leant me their GFX medium format camera system for the project which, coupled with my Profoto B1 strobe light, gave me the ability to shoot in the most challenging situations. My second post about The Defenders will be about techniques and equipment, together with a review of the Fuji GFX system. For now I will say that the series was shot with the bare minimum of equipment. We needed to be able to move around freely without being weighed down with camera gear. For the entire two months, everything that I carried with me was packed into a regular suitcase and a backpack. The Defenders was published on the 21st July 2018 as a nine page spread in the Guardian weekend magazine with my portrait of Ugandan ranger Samuel Loware as the cover shot (below). The series has been released as individual articles for The Guardian online and by Global Witness to accompany their incredible annual report which delves in to the issues in great detail. The photographs will be exhibited in London, at The Guardian headquarters from the 1st August and in Rio De Janeiro at the Museum of Tomorrow from the 3rd September, as part of a UNEP and Global Witness initiative. My list of thanks for this project is long and everyone mentioned below played a crucial part in the success of the work. It is important for me to give special thanks to Jonathan Watts, Leo Plunkett, Lucia Knight, Billy Kyte, Ben Leather and all of The Defenders mentioned below. Without these key people the project may never have happened. The Defenders - Nonhle Mbuthuma, Isela González, Ramón Bedoya, Maria do Socorro Silva, Marivic ‘Tarsila’ Danyan, Samuel Loware, Fatima Babu, Robert 'Bobby' Chan, Birhan Erkutlu & Tuğba Günal. Global Witness - Ben Leather, Billy Kyte, Amy Richards, Heather Iqbal, Mary Whittaker, Rebecca Lee, Sarah Trentham & Rachel Cox - The Guardian - Fiona Shields, Jonathan Watts, Kate Edwards, Louis Siroy & Caroline Hunter - United Nations - Niamh Brannigan, Angela Kariuki & Catherine Abuto - Fujifilm, South Africa - Hein Hough, Barry Matthews. South Africa - Siyabonga Ndovela, Sibusiso Mqadi, Allan & Elena Hein at Mtentu Lodge, Margie Pretorius, Johan Lorenzen, Richard Spoor, Keamogetswe Seipato, Amadiba Crisis Committee, Sustaining the Wild Coast, Alternative Information Development Centre (AIDC) - Mexico - Jose Angel Rivas Vega, Urbano Fuentes, Alianza Sierra Madre, Peace Brigades International - Colombia - David Jiménez, PBI Colombia - Brazil - Catarina Barbosa, Melina Marcelino - Mindanao, Philippines - Rene Pamplona, Dande Dinyan, all of the T’Boli community - Uganda - Sean Willmore from The Thin Green Line, Jon Mokombo from the Uganda Wildlife Authority, Johnson Masereka and Stuart Gakiza, all of the Kidepo Park Rangers - India - Prince, Raja, Sankar, Nityanand & Lois - Puerto Princessa, Philippines - The team at Palawan NGO Network Inc.